The 11th ranked Catholic University field hockey team continued its dominant season as they move on to the Landmark Conference Finals. The Cards registered their 3rd straight shutout and 7th overall on the season following a 3-0 victory over the Blue Jays of Elizabethtown on Wednesday night at Cardinal Stadium. The playoff victory continued the team’s 11 game winning streak which dates to September 23rd. The Birds are 15-2 on the season, and went a perfect 7-0 in Landmark play before entering the postseason. The Cards wasted no time getting on the board, when they found the back of the cage in the 9th minute. The goal came off a penalty corner from senior Lizzie Ireland to classmate Rachel Day, who proceeded to feed freshman Meghan Shallow for the rookie’s third goal of the year to give the Cardinals a 1-0 lead which would stand through the rest of the half. The Birds expanded upon their lead only six minutes into the second, when Day managed to scoop a loose ball off a rebound given up by the Elizabethtown keeper. She then lifted over the outstretched goalie for a 2-0 lead and completed a multipoint day. Despite the efficiency shown by the offense, CUA’s defense were the stars of the shutout. Senior goalkeeper Sophia Hamilton made 6 saves in her 5th shutout of the season, and improved her record to 15-2. Classmate and multi-time Landmark Conference Defensive Player of the Week Kelly Cousoulis stood out for the Cards as well. Cousoulis made a key defensive save late in the game to help halt a growing Blue Jay attack, and aided the defense in limiting its opponents to only 2 penalty corners. 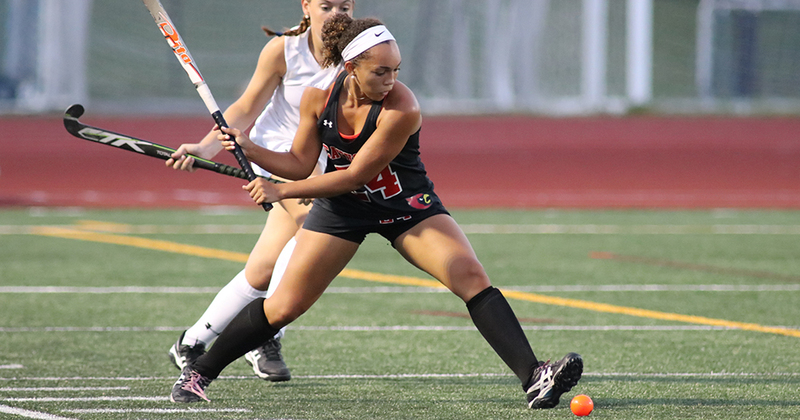 The final blow came late in the second half, when junior Hannah Schied sent an impressive cross in front of the goalie to sophomore Katie Anderson who sent a bullet of a one-timer for the final score of 3-0. The Eagles of Juniata were the winners of the other semifinals matchup, as they took down second seeded Scranton 2-1 in an overtime thriller. The teams have only faced off once this season in late September, where Catholic earned a strong 2-0 victory. Day, whose final stat line showed a goal and an assist, commented on the upcoming tilt. “Our teams have a long history in postseason play, and it’s always an intense game. The last time we saw this team in the conference championship was my freshman year,” Day said. The Cardinals will host the Eagles for the conference finals at Cardinal Stadium this Saturday, November 4th at 2 PM. The last time these two teams met in the championships, CUA was ranked 7th in the country, but lost 1-0 in a double overtime thriller. The team looks for revenge and to win their 2nd Landmark title in three years, as well as guarantee its bid in this year’s NCAA tournament. When asked about the team’s mental state in the upcoming clash, Day simply stated.